One of the most interesting markets in the realm of less obvious football bets is the Under / Over on Total Goals. It’s a bet type that is perhaps more common in sports played in the US, with American football being one that often features Over / Under bets. The principal remains the same in ‘soccer’, though the way that it is done can seem markedly different. It’s not unusual for American bookmakers to all set the same Over / Under mark, for example, such as for Super Bowl XXXIX when the casinos around Las Vegas set it at 46.0. Bettors would be looking at whether the combined score of both teams came in at less than 46. In traditional football it’s a similar thing, only you can select your own market. There are a number of bet types out there that people have intrinsically understood for years, even if they’ve never actually placed a bet. Comments like ‘this match will be a goal-fest’ or ‘I think this will be an incredibly dull game’ are, in essence, comments on where you think the Under / Over will end up at the full-time whistle. This is just a way of making it more official and putting your money where your mouth is. Still don’t know what I’m going on about? Read on. What Is a Total Goals Over / Under Bet? Once you enter in the world of looking as some of the slightly more off-the-beaten-track bets, even the most assured bettor can start to feel a little out of their depth if they usually tend to stick with more mainstream betting options. That’s why it’s always handy to explain exactly what a bet entails, so that we’re all on the same page before moving forward. Of course, you might well bet on the Total Goals Over / Under market on a daily basis, meaning that you might want to skip this section and head straight to looking at the sort of things you’ll want to bear in mind before you place your bets. One way of thinking about the Total Goals Over / Under market is as though it’s a Correct Score bet without needing to be overly specific. Let’s say that you think a game is going to be high-scoring but you have no idea which team is going to score the goals. 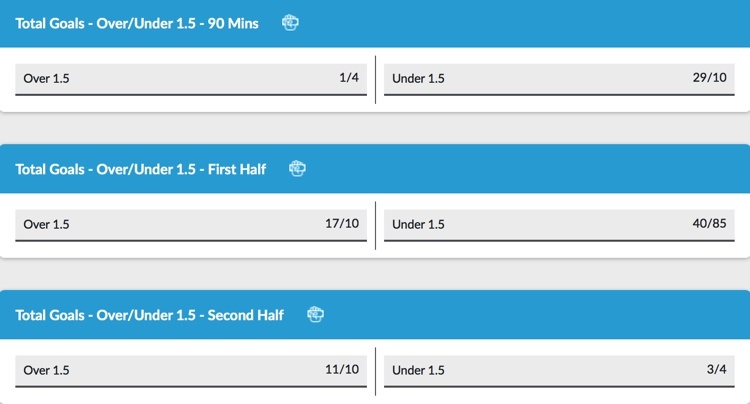 Instead of looking at the Correct Score market, where you’d need to actively predict that it will be 3-2 at the final whistle, you can instead opt for Over 3.5 Goals. That way, if the match features four or more goals in any format your bet will be a winner. It’s worth point out at this point that the .5 is in there in order to avoid bets needing to be ‘pushed’. That means that your stake is returned to you because the bet is neither a winner nor a loser. Bookies prefer clarity whenever possibly, so they add in the .5 to endure that there is definitely a result on Over / Under markets. It’s easy enough to work our whether or not your bet’s a winner, with a bet on Over 3.5 Goals needing four or more to be scored, whilst a bet on Under 3.5 Goals will need no more than three goals to be scored in the game and if there’s a fourth then your bet will be a loser. As obvious as it might be to most, it’s worth point out that there’s no such thing as half a goal in football, so if there’s a missed penalty then don’t be going to the bookmaker you placed the bet with and demanding that it be pushed! As with all bets, there are certain things that you need to know before placing your wager on the Total Goals Over / Under market. The first is that neither the scorer of the goals nor the team that scores them are relevant to the way that the bet pans out. You can place bets on things such as Team X to score Y number of goals, or Player A to net B times or more, but they’re entirely separate wagers. All you’re betting on here is the number of goals scored during the match by both of the teams taking part in the game. If you think the Home Team is going win 5-0 and bet on Over 4.5 Goals, but the score ends up being 3-2 then your bet will still be a winner regardless of the fact that your personal prediction was wrong. Because this is an FA Cup match and the Football Association confirmed that the competition wouldn’t have replays from the quarter-finals onwards any more ahead of the 2016-2017 season, the game needed to be decided on the day. That mean that if it was a draw at full-time the game would go to extra-time and, if needed, penalties. You can see from the title that BetVictor are very clearly pointing out that you’re betting on the Total Goals in 90 Mins. If you bet on Over 2.5 and the match goes to extra-time because it ended 1-1 after ninety minutes then your bet will be a loser, regardless of whether or not another goal is scored during the period of extra-time. You can see that they don’t mess around, making it very clear exactly what it is that you’re betting on by putting ‘First Half’ and ‘Second Half’ front and central next to the title of the bet. That’s what you’ll need to make sure you’re looking out for when you place your wager, as there’s nothing more disappointing than thinking you’ve bet on the full ninety minutes of a match only to discover that you had a bet on the first-half without realising. It’s worth noting that the odds of plenty of goals in one half are much longer than across the ninety minutes, so if you think it’s going to be a high-scoring match then that might be where the value is. It’s an obvious point to make, but the less likely the scoreline you opt for, the higher the odds will be. BetVictor obviously feel as though the Manchester United game will continue a few goals, so they’ve made the likelihood of there being more than 1.5 in the match very short at 1/4. They seem to think that there’s little chance that the game will be won 1-0 or end up goalless after ninety minutes, so it’s 29/10 for that outcome. Looking for some leeway in the market will allow you to place a bet that might have a decent return, but it’s always less likely to happen to make sure you look for the balance. This more all-encompassing set of options allows you to choose more random options that, as a consequence, increase the size of the odds. Over 4.5 Goals at 11/2, for example, is an interesting set of odds if you think that the game is going to be a goal-fest. Anything from a 5-0 whitewashing to a 3-3 thriller will see you paid out. Of course, it could still be a somewhat frustrating 4-0 and you’ll miss out on your winnings, but the point still stands. Check out how the bookie of your choice does things and make sure that you search around their bets if you think the first option that you come across is a little bit boring. You can see from that list that it’s unusual for a Premier League game to feature more than six goals across the course of a season. The sweet spot when it comes to betting is to opt for somewhere between two and four goals in a match. How you go about predicting which matches and when you should bet on it is up to you, of course, but it’s interesting to note that more games have finishes with two goals having been scored than either zero or six or more combined. Going for mega-low scoring games or majorly high ones probably won’t do you any favours. What Might Influence How Many Goals Are Scored? Having said that, some seasons you’ll find teams that score goals aplenty and you’ll want to be bearing that in mind when it comes to the placing of your bets. As an example, when Liverpool nearly won the Premier League in the 2013-2014 season, their games were full of goals. They scored 101 across the course of the campaign, but they also conceded 50. That means that in their thirty-eight matches there were 151 goals, or an average of 3.97 goals per game. Manchester City won the title by scoring even more – 102 – and conceding fewer – 37, resulting in games that had an average of 3.65 goals in them. If you’d have been looking to bet on either Manchester City or Liverpool’s games that season then you’d have wanted to go bigger than the above table suggests would be the norm. As an example, in the 2016-2017 season those scores are taken from, Liverpool’s matches had 120 goals in them and Manchester City’s had 119. That’s an average of 3.15 goals per game for Liverpool and 3.13 for Man City. If teams have matches that are against the usual average then you’ll want to think about them if you’re betting on the Total Goals Over / Under market for their games. Once you’ve decided whether or not a team seems to be scoring more than the average number of goals in a game, you’ll want to consider if there are any factors relevant for that specific side at that exact time that you need to bear in mind. For example, you might look at Tottenham’s games from the 2016-2017 season and see that they scored eighty-six times, but that Harry Kane scored twenty-nine of them. If a striker is in good form then you’ll want to see whether they’re playing or not before trying to figure out if their team is likely to rack up a load of goals. Who gets the assists? Are they playing? It’s not just defenders that can have good seasons, of course. Staying with the same 2016-2017 campaign, Chelsea won the league conceding thirty-three goals. That’s less than a goal a game against them. Thibaut Courtois won the Premier League Golden Glove that season, keeping sixteen clean sheets. If he was out injured or had picked up a suspension, did the number of goals conceded increase? Is there a defender that makes a team play better when he’s in the side? What happens to the ‘Goals Against’ column when he misses a match? Anything from whether the referee is quick to give away penalties through to where the match is being played can influence how many goals it will contain. Doing a quick bit of research on those matters will make your life so much easier when you’re wondering which way to place your bet. There are countless resources out there for you to look at, especially if you’re betting on one of Europe’s top five leagues. Even if you’re betting on a random division in Israeli football or the like, there will be information out there about a team’s previous few matches. Look it over and make an informed decision about whether they seem to be scoring loads of goals and the opposition seem to be conceding plenty.